I was a little star struck the first time I tasted a fresh fig. That might sound a little funny to you, but it’s the closest analogy I can find. Imagine a little girl who equated figs with Fig Newtons – a chewy cookie with a filling that was sweet and mysterious. Growing up in New York, fresh figs were not a common sight in the markets, ever. To me “fig” sounded like a cute name for a packaged good. It wasn’t until many years later that I bit into my first fresh fig, and it was like meeting my favorite actor in person for the first time. I was struck with its beauty. And I was pleased to learn that they are better in real life. And they are. Fresh figs have found a very special place in my heart. 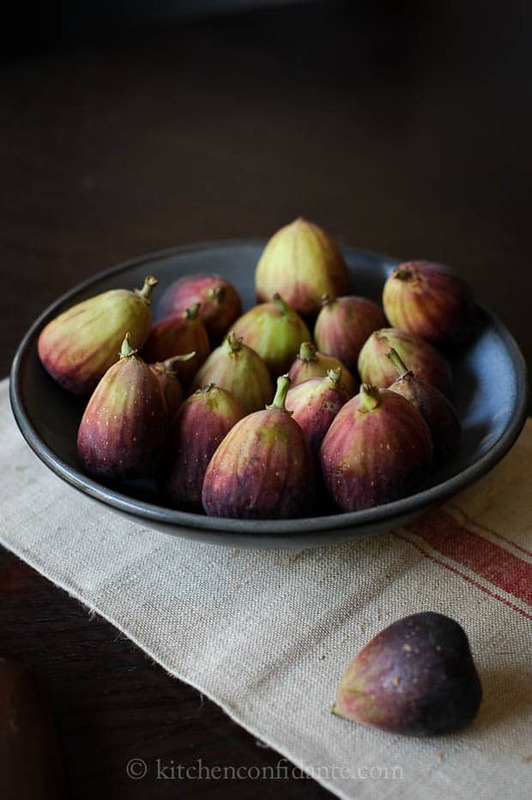 It’s one of my favorite fruits of summer, and living now in California, I feel very blessed to have access to an abundance of figs this time of year. It’s the one fruit I find myself wistfully craving in the winter months; the season can never get here fast enough. The other day, I nibbled on them, some plain, some smothered with goat cheese, drizzled with honey. I would have been happy eating nothing else. Yesterday, I was excited to join Azmina from Lawyer Loves Lunch as she hosted a jamming party for mutual friends in the food blog world. It has been a year since I have seen Lisa, Gina, Jean and Stephanie, and we gathered in Azmina’s bright kitchen to catch up while chopping summer fruits and learn the finer points of jamming. 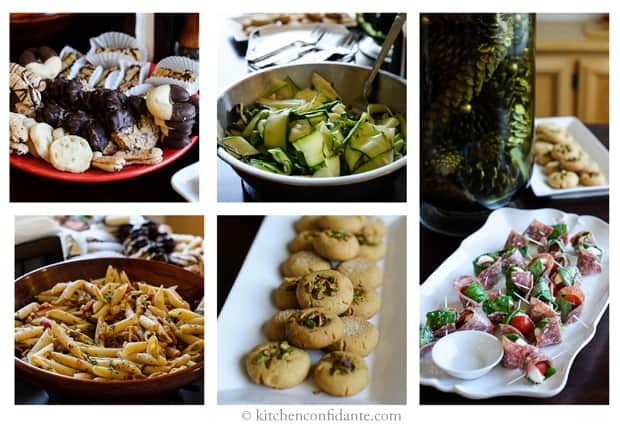 But of course, you can’t have a roomful of foodies together without delicious food. Everyone brought delicious and fresh dishes to nosh on as the fruit bubbled on the stove. All except me. I had been working on what was to a be a beautiful tomato tart that morning, only to have an accident as I pulled the hot crust from the oven, leaving me with a broken crust and burns on my arm. Nothing like driving to Azmina’s house with an ice pack on my arm and aloe in my purse! I took solace in the fact that if anyone would understand, it was my friends, who were quick to share their baking battle scar stories. Thanks, you guys, the food you brought was delicious. My dearest Lisa, who lives fairly close to me, and writes Authentic Suburban Gourmet, makes the most divine Fig Balsamic Jam. 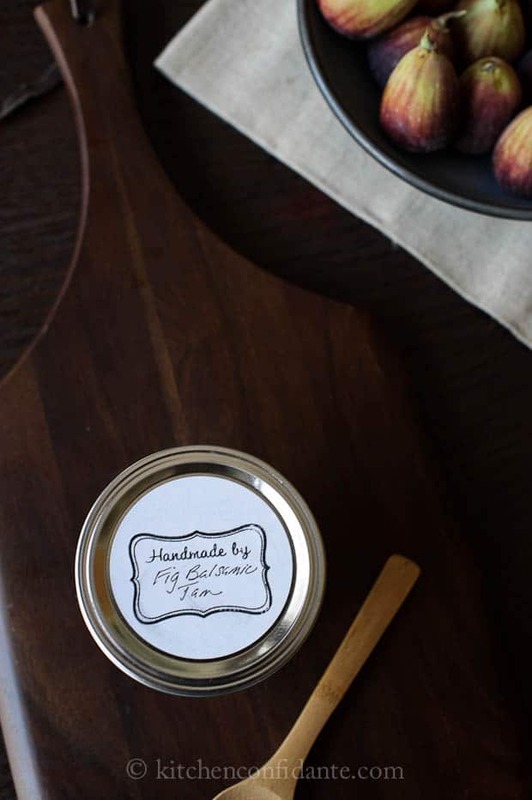 The first time I met her, she had gifted me with a jar of this sublime creation, and my eyes grew large as I saw her unpack pounds and pounds of gorgeous figs to make her jam. 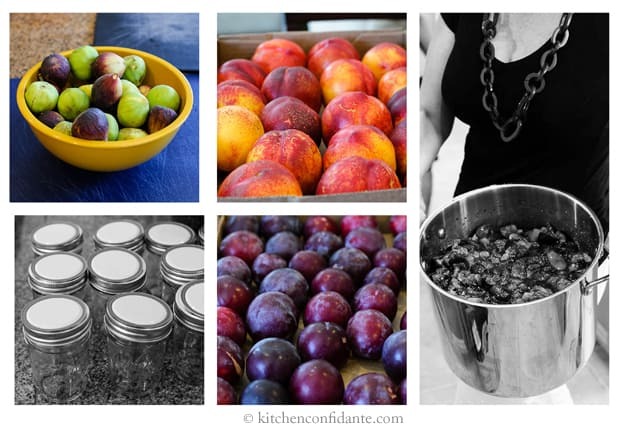 Gina brought amazing plums and nectarines from orchards in Brentwood and Santa Rosa. It was hard to not sneak in a few bites as we chopped up the beautiful fruits. I could not stay the entire afternoon, but it was so nice just to see everyone and chat and learn from one another. But I did bring home some jam. Smothered over a piece of toast, it is a sweet and simple treat any time of day. I placed a dollop on an English muffin for breakfast this morning, and I can’t wait to play with it some more later today. 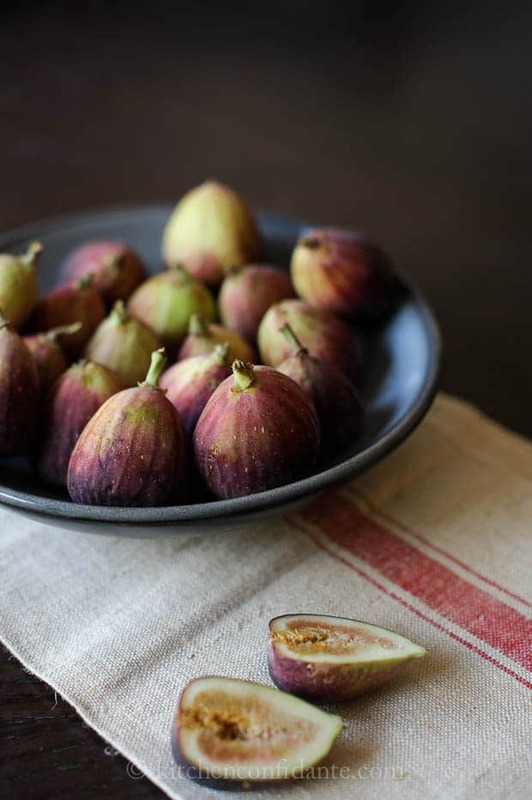 I may try Lisa’s gorgeous Fig Jam Straws – that would be fabulous with a glass of wine and some slivers of cheese. Or I may just eat it by the spoonful. 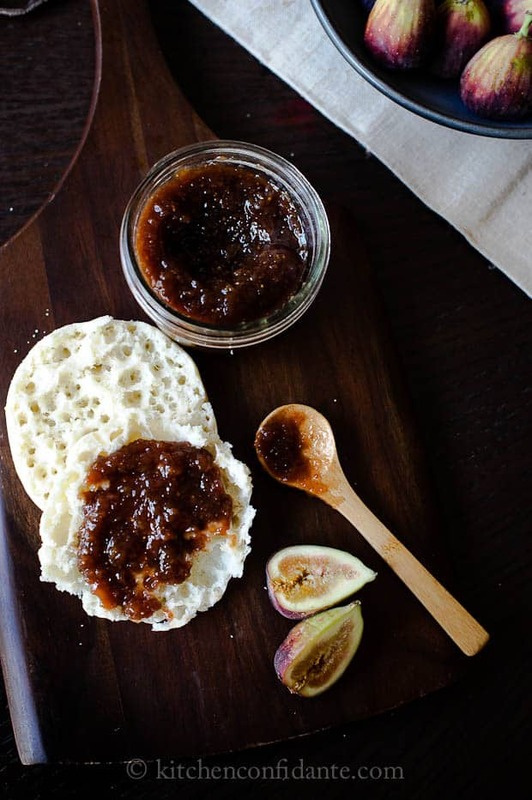 If you would like to try Lisa’s Fig Balsamic Jam (and you must! ), please visit her for the recipe, which can be found here. Her recipe as written, includes a little lemon juice, but she omitted that in yesterday’s jamming party, with equally delectable results. Oh my gosh, I just love, love fig jam! The thought of a recipe just got me so excited. I believe you, it must be fig-fabulous! Heading over now to your friend’s site to see the recipe. Thanks for sharing, Liren. Hope your burn heals fast. Wish I lived closer — I love your food, stories & recipes !!!! Have a superb “Simple Sunday” ! Liren – I am still amazed that it had been one year – it seemed like yesterday that we saw each other. Need to change that. :-) Great to see you yesterday and I have your box of goodies to bring to you. I will actually posting the fig jam and party hightlights today too. Loved your post and hope your burn is healing. Just give you a quick preview of what is coming your way – Blueberry & Nectarin Jam, Santa Rosa Plum Jam and Strawberry Lemon Jam. Ping me and we can coordinate a date to get together. Hope your party last night was a blast!!! Great to see you!!! I know!!! I can’t believe it’s been that long, either. Since we interact so much online and on all forms of social media, I feel like I see you a lot, but there’s no replacement for real face to face hanging out! Let’s definitely plan a little date soon. You are an angel to bring me a box of goodies, so sweet, really, I would have been simply satisfied with this amazing jam, but now I can’t wait! Also looking forward to your post later today, and I will be sure to update my links to point to your new one. Wish I could have stayed longer yesterday, these weekends get so crammed with fun stuff – looking forward to resting today for sure!!! p.s. And thank you, my burn is definitely healing. Little C thinks it looks like a bear scratched me, LOL. Azmina, thank you again for generously hosting such a fun time! I regret not being able to stay the entire afternoon – too many activities in one Saturday! It was wonderful to see you, to jam along, and to fawn over your little guy, he is a major cutie! Hope you have a relaxing Sunday! Sounds like an amazing get together! Sorry your burned your arms, and your tart didn’t work out! Hope you have a great weekend! What a fun Saturday afternoon, I love the idea of a jamming party. I hope your arm heals quickly – burns are no fun! Sounds like a wonderful day! If ever I get to be a part of a food bloggers jamming party, I would come with an empty stomach. Love the photos of the food. Accidents happen in the kitchen. Hope your burns heal fast. Liren, what a fun day! Your post has inspired me to arrange a jam making day at my house. Actually, I have been thinking lately of doing something like that. I have been in a jam making frenzy – making five different jams over the past month or so. I haven’t been able to resist all the beautiful and tasty stone fruits at the Farmer’s Market and figured that jam was the perfect way to extent the season. Take care of that burn and heal quickly! 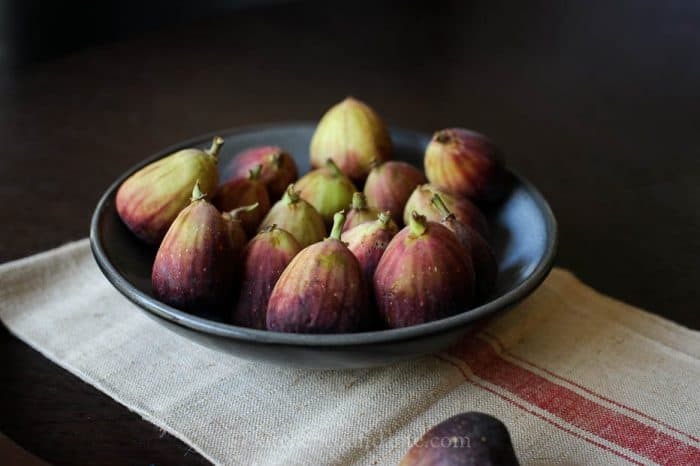 I had the same early childhood memories of figs – I didn’t even know they were a fruit – and it wasn’t until I tasted on YEARS later I learned how wonderful and beautiful they really are. Hope your burns heal well! I’ve had plenty myself! Lovely post, my friend. I also remember the moment that I first tasted a fig. It was heavenly…and it still is. The jam looks just perfect on that English muffin. Thank you for sharing! Hi, Liren! I saw this post from Lisa’s blog as well! I’m gonna say to you what I said there…First off, I’m so jealous you guys live in a wonderful state! Secondly, I’m so jealous that you guys made jam! Plus, what a wonderful lunch spread you had there! It’s interesting to see the same scene photographed by different people…it’s amazing how talented and unique each person is! In India the only kind of fig I ever had was dried and I loved those. It was only last year that i had my first fresh fig and now I cannot get enough of it :) The jam sounds lovely specially with balsamic! These figs are lovely. Great job on the photos. Liren, we had the same start with figs: Fig Newtons. :) I didn’t appreciate them until I became an adult and one of my favorite ways to enjoy them now is through Lisa’s excellent jam. So wonderful to see you again–it was definitely time for another blogger get-together. Hopefully, another year won’t pass before we all see each other again. I love it whenever foodie’s get to meet. So sorry about the burn — hoping it’s healed. Oh this is just perfect! 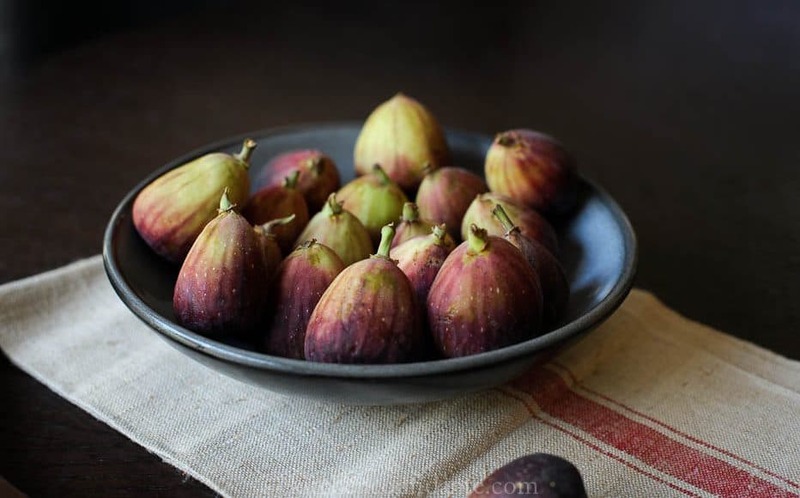 If I have figs around me I cannot stop myself from eating…they are so good! Jam is wonderful idea! What a wonderful gathering this must have been :) And your jam looks amazing…I adore fresh figs as well, truly lovely!